Moore Gear | Ohio Belting & Transmission Co.
As a distributor for Moore Gear, we make it easy for you to purchase the gear rack you need. Want to order gear rack you can't find? Moore Gear and Manufacturing Company has built a national reputation since the 1930's as a custom manufacturer of gears and gear racks. For Moore Gear, every job is a special order with precise specifications and stringent deadlines. Customers in the industrial, agricultural, machine tool and commercial markets throughout the United States, Canada and Mexico have come to depend upon Ohio Belting and Moore Gear for precision products and dependable delivery. Continued investment in the latest machine tool and electronic technology assure a state-of-the-art product, and maintain Moore Gear's high quality levels at a reasonable cost. Custom and stock gear racks are manufactured on the latest CNC rack machines. All gear racks have tight tolerances on the tooth to tooth spacing, an excellent machined finish on teeth, and a steady pitchline to back dimension. All this translates into a smooth, steady ride for the pinion. Custom gear racks are made-to-order in various sizes (rectangular, square, round and hex) and lengths with available customizing services. 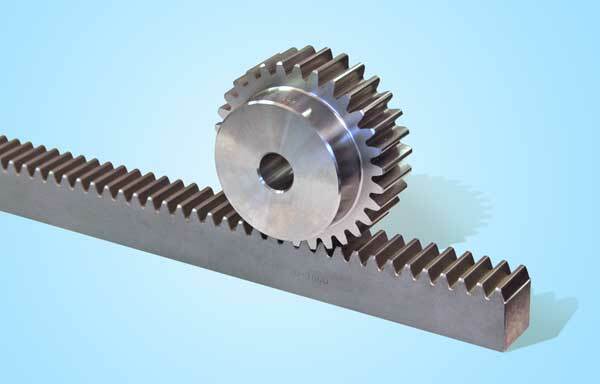 They also manufacture helical gear racks. All gear racks can be milled and matched for continuous travel and drilled per customer specifications. If the gear rack you are buying is too expensive, call us and we can help solve your problem.